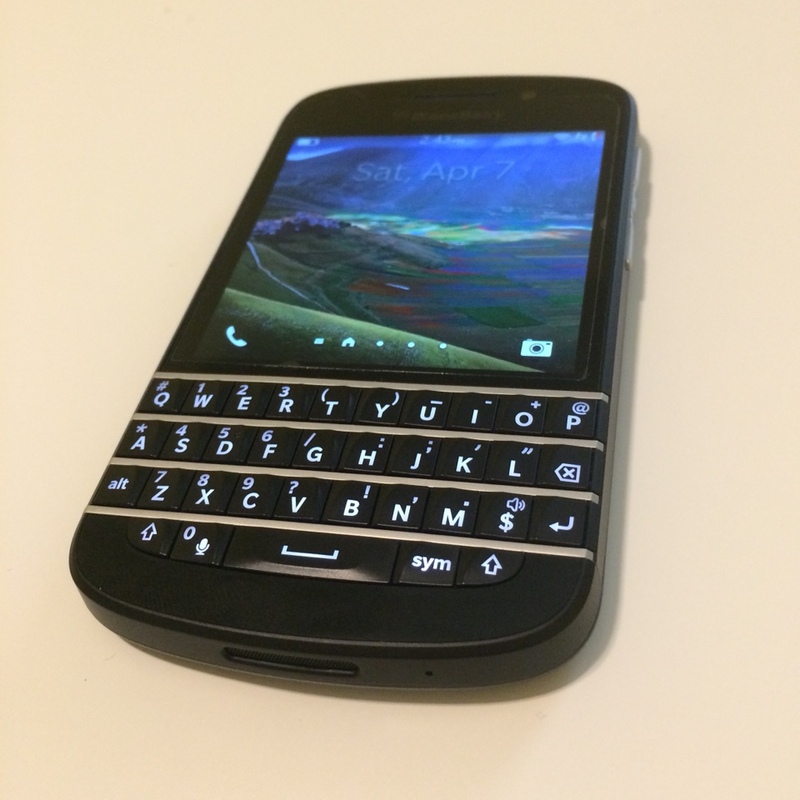 The first BlackBerry Q10 devices became available for purchase in April of 2013. So happy 5th birthday, Q10! As soon as I got my hands on a Q10, I was hooked. I owned and used several devices across all the major platforms (BB10, Android, iOS, Windows Mobile), but I always kept coming back to the Q10. When the last Q10 I owned started randomly rebooting and shoving paper in the battery compartment didn't help, I decided to give it away to a collector. I had, after all, replaced the bezel of the black model with the silver one from a white model, giving it a rather "bold" look. But I never did get another Q10 after that. BB10 was already on the slow grind to obsolescence and I decided to move on. Curious technology geek that I am, I wanted to try something different. After a hard-fought battle between iOS and Android for my "daily driver" status, Apple finally sucked me into their ecosystem. I even tried a PRIV and KEYone and there was a lot to like about them, but Android just grinds my gears for so many reasons (not the least of which is the tracking of my every activity for the purposes of targeted advertising). BlackBerry Limited just issued another OS update for BB10. Nothing crazy, just a patch for that nasty KRACK WiFi vulnerability an update to the Webkit libraries for the browser and a couple other minor things. I know the end is nigh. BlackBerry World will completely shut down the last day of 2019. I just ordered a like-new Q10 on eBay for $55.50. Five years later, there's still no device out there quite like it. Apple has won me over, but I may try using a Q10 as my daily again for a while, if only for the sake of nostalgia. Do you still use your Q10? Why? Have you moved on but still miss your Q10? Why? Share your thoughts about the one-of-a-kind BlackBerry Q10. PantherBlitz, coffee-turtle, BerryRipe and 7 others like this. Glad to see Newfangled back!!! Awesome ...yes I still use a Q10 for work email, and have a spare in a drawer that I dust off when I travel, I also rock it as a portable music player as its so damn small to carry around when listening to tunes. So much has happened in 5 years! Look how excited CBK was about the Q10. coffee-turtle and CARLOS PEREIRA2 like this. I like what you did with that mod to your black q10. Looks like it would indeed have been a one if a kind collector piece. I had a red Q5 for a while. The clicky-est keys ever. Very nice little phone. But you could definitely get a used black Q10 and a silver frame from a white Q10 for very cheap these days. If I decide to keep my new Q10 I may just swap in a silver frame, myself. The Q10 is a little beast of a phone, I'm using the PPSE now but I trade off from the Classic or the Q10 from time to time just to keep things interesting. It's hard to pick a favorite, they are all great devices. To bad BB never made a real Q20. Classic is just bulkie with same internals. And the worse is there is no upgrade part for us. People are saying forget it and move on. I carry GS7 in my other pocket, a phone 3 years newer and yet I prefer Q10 in many cases. Lame situation, people dismissed great hardware and software in favor of gimmicky free (expensive) apps. I still think if Blackberry had delivered the Q10 first and devoted all of their time to only tuning the OS for that form factor it would have given BB10 the best chance to succeed. I would love to have a Q10 with a top shelf processor, camera, and updated browser. coffee-turtle and BerryRipe like this. I loved my Q10 as well! Admittedly, if the Classic came out first, I would have had that model instead. But was very happy with the Q10...so slick and easy to palm and pocket! I still use my white Q10 and I love it. It fits perfectly in my hands, the sound quality is first-rate, and the keyboard is the best! When was the that update released for the Q10? I haven't used my Q10 for a while but would like to keep it as 'up to date' as possible, for when BIS goes off and I have to finally resign myself to giving up on my 9900.
my q10 had got the 10.3.3.1463 official update should I update it. I forgot how brilliant this device looks and feels in-person. Last edited by Newfangled; 04-07-18 at 04:26 PM. Avenzuno and zer0ten like this. By always, you mean till January 1st 2020 (hopefully rumors are wrong). Even if it somehow becomes completely unusable on that date, we still have 20 more months to enjoy it! zer0ten and BerryRipe like this. My sim card reader got mangled on mine, and rather than try to repair I picked up a classic. I thought the Q10 was just a tad too small for me. The classic isn't any faster, is it? Funny with the Q10 and the Classic, I really don't think faster. I mean, that was the whole point for me. I wanted a simpler, less complicated experience. I like the simplicity of the hub. I'm jumping from apps and the browser is not the most dynamic. On the Classic vs. Q10 - for me, I like the slightly larger size and the dedicated keys to make and end calls. Quality accessories make all the difference!